Out of 85 species of cetaceans can be found in the seas and oceans of the world, 29 of them can be found here in Gran Canaria. 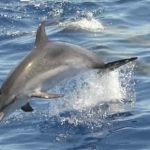 Dolphin’s intelligence has been well documented and that must be one of the reasons why they choose to live in Gran Canaria. When you think about it that’s one third of the worlds population, and considering some species live exclusively in the polar regions, rivers and very limited areas, we find ourselves in a very privaleged area for observing these magnificent creatures. Cetacea is the order of marine mammals that include whales and dolphins and porpoises. Cetaceans come in a great many different sizes and shapes. From small dolphins at one meter up to the biggest whale which comes in at over thirty meters and is the biggest animal on earth. The different family groups start moving as soon as the first rays of sun hit the beaches. Their dorsal fins are known locally as “toninas” and their appearance guarantees that the fun is about to begin. The sighting of their fins becomes the main attraction for the day. For this reason, in recent years a number of local companies have been providing the opportunity to get close to the dolphin families. They use authorised boats that are licensed to bring visitors close to their habitats, whilst guaranteeing that the legal requirements are maintained and due care is taken. Visitors are supervised and accompanied by experts and biologists who provide extra information on the whales and dolphins. Greek “kephale” for head, a clear reference to its bulbous shape. Striped Dolphins are not as trusting as other dolphins. They seem shy and rarely approach boats. Sometimes they swim very fast and jump several metres high. from or dominance with other males. Songs are population-specific and change over time. Very hard to follow at sea, they are thought to be deep divers and can remain submerged for to 15 minutes. weaning age. Spotting becomes more intense with age. Contrary to their image as “friendly” animals, bottlenose dolphins can act aggressively toward other cetaceans. This aggressive behavior is especially displayed during mating season, when males are known to fight to be able to have access to the females. We sail in search of these wonderful creatures, supported by a guide and specialized equipment to listen to the dolphins. 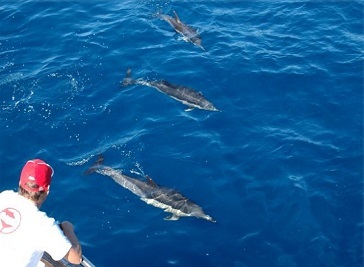 We have two different excursions; the “normal” 2 hours dolphin and whale watching trip and, 3 days a week (mo. wend. and fri) one extra hour afterwards for a swim stop in a bay before we sail back to the harbour.